The plan was presented Wednesday during the Covington Business Council monthly luncheon. A BID is a geographic area where property owners agree to a special property assessment to pay for services and programs in this area beyond what the city already provides. These services and programs are designed to enhance public spaces, assist in business retention and attraction, and ensure the economic vitality of the area. More than 1,500 BIDs now operate in North America, a news release said. “We believe that creation of a BID and the benefits it will bring to downtown will make Covington a more competitive, safe, and attractive city,” said Tony Milburn, a Covington real estate developer who owns ten properties in the proposed BID and who spoke in favor the initiative at Wednesday’s CBC’s monthly luncheon. He added that nearby cities of Lexington, Louisville, and Cincinnati already operate BIDs. “I think that people like me, who will be paying into this BID, should see this payment not as an expense but rather as an investment into their properties and downtown Covington,” said Milburn, who also chairs the CBC Foundation. Supporters of the BID plan to begin circulating petitions seeking to create the BID next week. They hope to obtain signatures from 60 percent of the property owners in the district, which they will submit to the Covington City Commission to create the new district under Kentucky law. A similar effort failed five years ago amid criticism of its boundaries and a lawsuit from a large property owner. That lawsuit was ultimately dismissed. 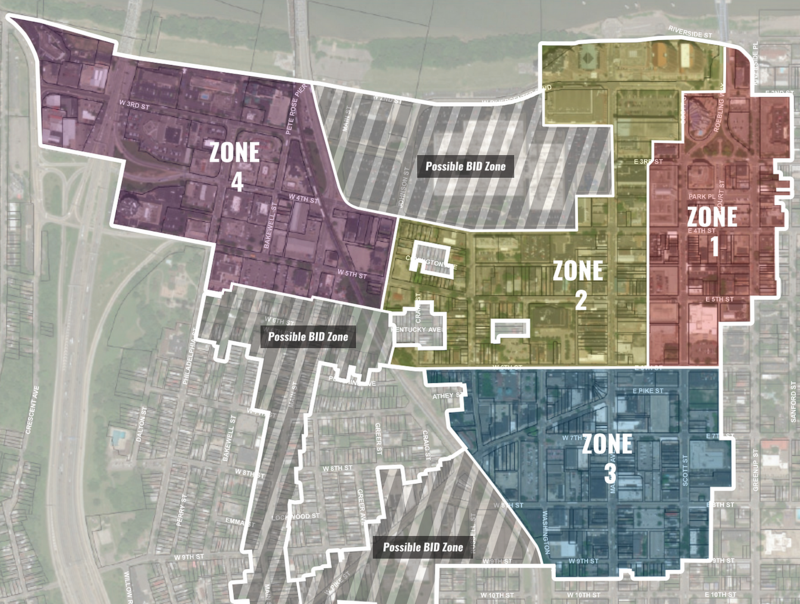 In the new version, the BID would cover a large piece of downtown Covington in four different zones. Most of Mainstrasse Village business district, the area where the IRS “flat top” building is located, and properties along Pike Street from the CSX railroad south to I-75 were considered for inclusion in the BID, but ultimately excluded from the final district boundaries. Summe said that the IRS building, which the federal government plans to shut down later this year, and other properties near it were excluded from the BID at the request of city officials, who want to wait and see what future development plans for this area look like. The BID committee also eliminated Pike Street west of the railroad from the district because redevelopment efforts in this area have not reached critical mass and these properties were unlikely to receive much benefit from a BID at this time, he said. Under the terms of the BID petition, people who own “commercial properties in the district, as these properties are identified by the district, would be assessed 10 cents for every $100 of assessed value of their properties, with a $15,000 cap. In other words, a commercial property whose real estate is currently assessed at $200,000 would pay a $200 special assessment. Approximately 400 commercial properties in downtown Covington will fund the district, generating about $305,000 in annual revenue. Property owners who will not pay any special assessments are owners of single-family homes, residential condominiums, two-family and three-family buildings, and properties owned by government agencies or nonprofit organizations. An independent board of directors consisting of commercial property owners within the district will govern the BID. They will be voting board members with the responsibility of establishing budget recommendations, determining what services and programs the BID should provide, and hiring a manager and/or contractors and vendors to provide these services and programs. These board members will be selected from each of the four BID zones identified on the map as well as individuals representing a properties assessed at each of these three different value levels -- properties assessed above $20 million, properties assessed between $1 and $20 million, and those below $1 million. In addition to these seven commercial property owners, the board also will have five ex officio members. They will not have voting rights but instead will provide information and advice to the board. Representatives from the City of Covington, Kenton County, Renaissance Covington, the Catalytic Development Corporation of Northern Kentucky, and the Covington Business Council will serve as ex officio board members. Under state law, the mayor of Covington, with approval of the city commission, must appoint the BID board members. BID supporters hope to gather the signatures needed to present them to the City Commission in late summer so the Commission can approve an ordinance creating the BID and placing the special assessment on property bills this fall. Other speakers at Wednesday’s luncheon who urged adoption of a BID included Terry Sweeney, president/CEO of Downtown Lexington Partnership, which runs the Lexington BID and explained the benefits it provides in that community; Mike Conway, chairman and chief portfolio officer for Winegardner & Hammons, which owns the Covington Holiday Inn; Keith Bales, owner/president of Tag Team Services, which currently provides trash and graffiti removal for the CBC in downtown Covington; and Edward Wimmer, co-founder and CEO of Road iD, who renovated a historic building at Eighth and Washington Streets and moved his business to Covington from Boone County last year. A website has been created for more information: www.covnow.org.